The past few weeks we’ve released data on the SW Florida real estate market showing a pretty healthy market. We have noticed a shift in buyer attitudes the past several weeks and those can be a blip on the map or the start of a trend. Late Season always provides the answers to that, so we won’t be able to track for several more weeks. 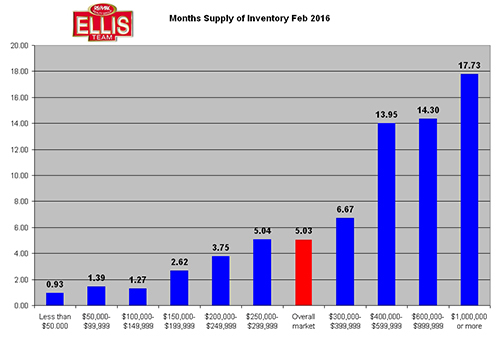 What we can track among other things is the Months Supply of Inventory. 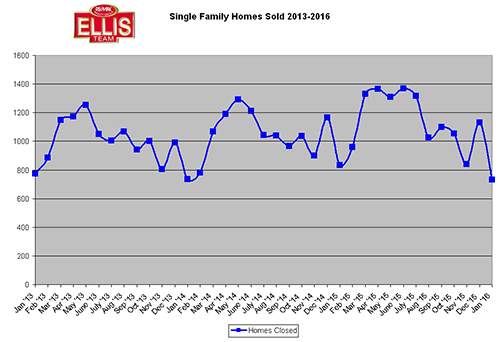 We’ve provided the graph from last year showing the overall single family market at a supply of 5.5 months. Anything less than 6 months is considered a seller’s market. A balanced market is generally a 6-9 months supply of homes on the market. In 2016 we’re looking at a 5.03 months supply of homes on the market, so it’s more of a seller’s market today than it was last year. Almost all categories improved except for a few. The $400,000-$700,000 market went from 10.89 months last year to 13.95 months this year. The $600k-$1 Million market went up as well, but ever so slightly from 14.12 months to 14.30 months. Overall we’d say these are pretty stable numbers. Most other price ranges decreased which puts more pressure on buyers. So here’s the takeaway if you’re considering selling in this market. You should always price your home correctly. That’s a given. 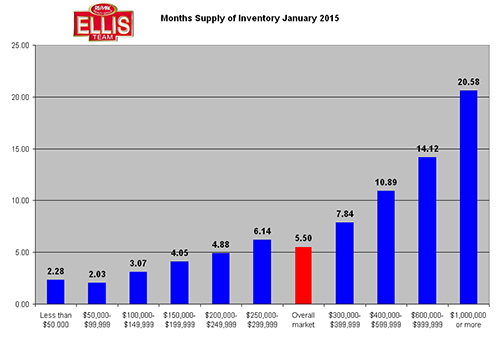 And if you’re selling a home in the $300k+ range, you’re looking at supply of inventory over 6 months. If you’re over $400k you’re facing significantly more competition for the same buyers, so it will take longer to sell your home. There are fewer buyers the higher in price you go, and I’m sure this is true in most markets across the US. That’s not rocket science. What’s amazing this year is how dramatically the chart starts moving right at $400,000. And this year we’re seeing resistance over $300k which may influence the numbers later on in the year. Keep in mind these data points are good for a specific point in time. It’s like a photo. It shows you what’s happening at a specific moment. A movie however is a series of snapshots over time, or even perhaps real-time if it’s live video. In the trenches we’re seeing buyer reluctance. It’s kind of like a fishing hole. You go there every day for a few years and it produces results. And the next day seems better than the last, until one day something changes. You get nibbles and bites, but you can’t hook-em like you did the day before. It takes more work, and even then you don’t always get them in the boat. Sometimes they find a way to sneak off your line by the time you reel them in. Agents today feel like that fisherman where something is up. You’re not sure if it’s the weather or what’s affecting the fish. All you know is the fish are running scared and they’re hard to land. If you’re a buyer, homes in many price ranges are flying off the shelf. And rates are low, so now is the time to lock down that purchase. As you move higher in price there is more selection. You can search the MLS at www.LeeCountyOnline.com if you prefer to start online. 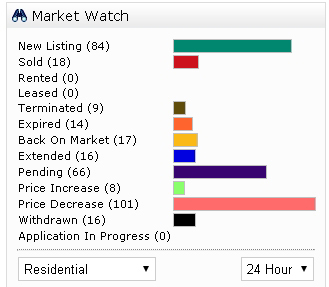 We have Free market reports too on our site so you can see what’s going on in your neighborhood. When you’re ready to make a move, give us a call. We can go over your options. 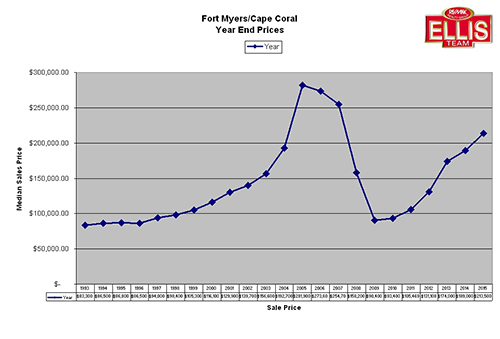 Shift in SW Florida Real Estate Market? Is there a shift in SW Florida real estate market? Many agents I’ve talked to have complained that buyers thus far this year lack a sense of urgency. They’re making offers at times but then shutting off to counter-offers. For some listings, there are no offers at all. Last year it was common to have multiple offers per property. Prices were rising and Realtors could price homes ahead of the last known sale. This year might be different. We’ve noticed a slowdown of offers on homes priced about $275,000 and up. One Realtor we talked to this week has noticed a slowdown on homes over $200,000. Is the stock market affecting the real estate market? Some speculate yes, others aren’t so sure. Sometimes there is a flight to tangible assets like real estate when the stock market is in trouble. Other times the stock market affects consumer confidence and people are afraid to do anything. Let’s look at some of the numbers. Just because Realtors start talking doesn’t mean the numbers bear out their suspicions. This confirms that so far this year new pending sales are off as well. 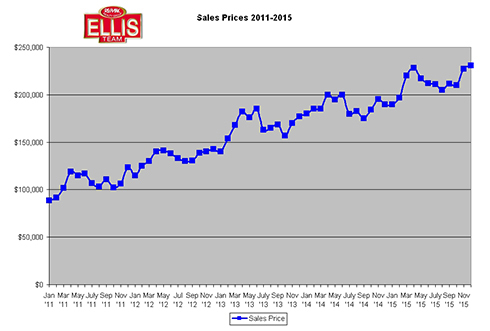 Of the pending sales, average price is down. We won’t know what these pendings close at until they close, and of course we’re not dealing with a full month. In December, the average closed sale price was $333,735. Official January numbers won’t be released until later this month. If the rest of the month holds true, it would confirm strength in the lower price ranges and lack of urgency above $280,000. What should sellers do with this information? They could wait and see if this is a temporary lag in the market. 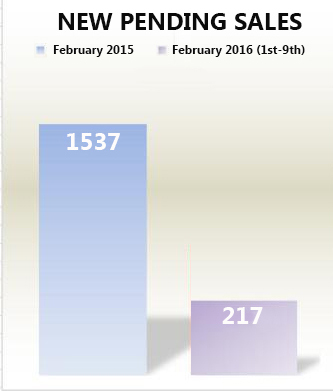 This sometimes happens as season picks up steam the latter half of February and into March. Or, sellers could reposition their home in the marketplace and be the first ones out in case buyers remain unmotivated. In January we listed two condos in Reflection Lakes and sold both within a matter of days. Just because the overall market may see a shift doesn’t mean all properties are affected exactly the same. If you’re putting your home on the market, it pays to look at what has sold and what your competition looks like. Look at it objectively like a buyer would. If you have had your home on the market, look back and see how you made your initial determination. Did you price ahead of the market expecting the market to increase? Look at it like a basketball game. Just because your team had a good 1st quarter doesn’t guarantee you a solid 4th quarter. To win you have to be better at the end of the game, not just at the start. If your home has been on the market and not selling it’s either the marketing or the price. And even if it’s the marketing, chances are it still might be the price as well. I’ve been tracking a few listings that interviewed with us and went with another Realtor who listed at a higher price. In each case, those properties are still on the market and they’ve reduced the price down to where we initially said. They are still on the market, and if buyers remain indecisive, they may end up reducing more. Sometimes it’s best to be the first one out than to languish on the market and compete with all the other sellers reducing their prices. Of course, Season could kick in any moment and clear out the inventory shelves. Check your competition for yourself at our SW Florida MLS Search Site or call us at 239-489-4042 We can help you sell your home and find your next home as well.